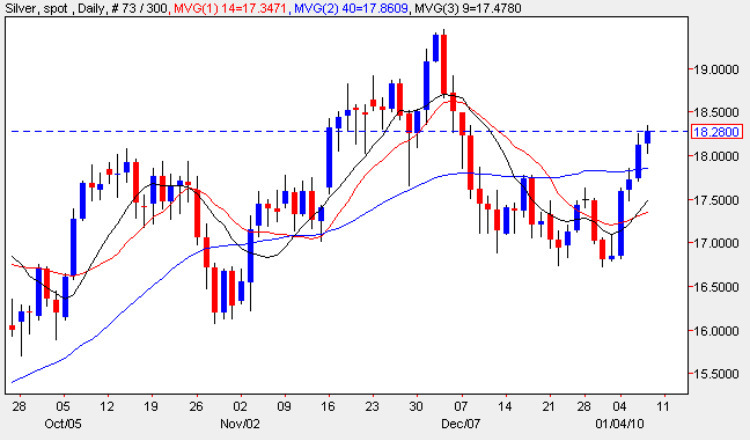 Spot silver prices continued there healthy start to the new year with another day of gains, ending the silver trading session with a narrow spread up candle which flirted with the lower level of a significant resistance level in the 18.25 per ounce region. With yesterday’s candle breaching the 40 day moving average, and with the 9 day average crossing above the 14 day moving average on the daily silver chart, the technical picture looks positive for spot silver, and should we see a break and hold above the $18.75 per ounce price point in due course, then this should provide the platform for a sustained move higher to retest the $19.25 per ounce level once again and from there break out into new high ground in due course. With a deep and wide level or potential support now sitting below in the $17 to $18 per ounce price region, this adds a further degree of comfort to the move higher, with any short term reversal lower now supported from below.